In 2005 brothers Dustin, Trevor, and Brady Brau decided to move brewing operations out of the Lucan, Minnesota brewpub they had ran since 1998, founding Brau Brothers Brewing Company. Their family name could only be more appropriate if it had the umlaut – bräu is the German word for brew. 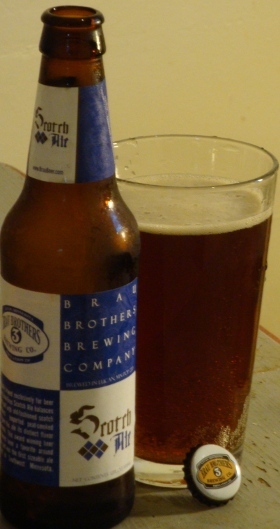 Tonight I will be trying two Scotch ales made by Brau Brothers. Both are made with peat-smoked malt, but only one is labeled peated. Peat is compacted, decaying organic matter that forms naturally in the bogs throughout Scotland (and other high latitude areas), the first stage in the formation of coal. Because of the high energy content, peat is harvested and dried for use as fuel. For many years peat was the primary fuel used in malting kilns in Scotland, used to make malt not just for beer, but also for Scotch whisky. Nowadays, malt kilned over peat lends its characteristic smoky flavor to many types of Scotch as well as Scotch ales. First up, a beer simply called Scotch Ale, which pours a nearly clear caramel brown color. There is not much head, just a few off-white wisps. The nose is malty, with a prominent nutty sweetness. 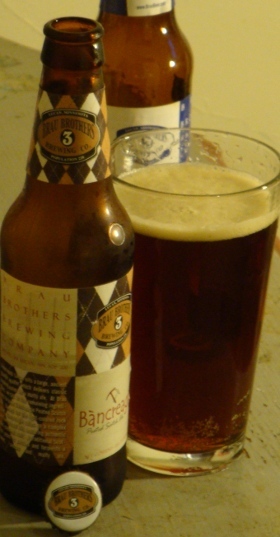 Caramel and light toast add to the malty complexity. There is a hint of smoke that contributes an almost mesquite character to the aroma. Delicate and wonderful. The nose is not very smoky, but the flavor certainly is, though not on the order of a German rauchbier. A rich caramel malt sweetness compliments the smoke, and the taste of hazelnuts and an herbal hoppiness round it out. The peat character dies away much too quickly, leaving a sweet, almost cloying aftertaste. More smoked malt would disrupt the careful balance, so the only solution would be to modify the recipe to create more fermentable sugar; were it a bit drier, this 7.3% beer would be dangerously quaffable. Now I will move on to the Bàncreagie, labeled a peated Scotch ale. A clear, caramel-colored brew with some off-white head, much like the regular Scotch ale; the aroma of this one is actually milder. A bit of malt and some smoke character, but mostly a watery nose (if that’s possible?). The flavor is also much milder than the above, which I was not expecting, given that this one is half a percent stronger and specifically labeled peated. The clean maltiness of this beer is more like a northern English brown ale than anything Scottish. The rich bready character of the Golden Promise barley is evident. A mild unpleasant character of fusel alcohols mingles with almost imperceptible smoke. As you drink the Bàncreagie it gets easier to tell yourself that all of that flavor is from the peated malt. There is one thing this one does much better than the first – body. Where the Scotch Ale was sweet to the point of cloying, the Bàncreagie is dry enough to drink but sweet enough to prove the malt bill. Now if only there were a significant peat smoke flavor. P.S. I know what day it is. I’m Scottish, not Irish. This entry was posted on Thursday, March 17th, 2011 at 19:50	and is filed under American Ale, Strong Beer. You can follow any responses to this entry through the RSS 2.0 feed. You can leave a response, or trackback from your own site.